Located at 7942 Mitchell Road, Eden Prairie Green Lotus Yoga & Healing Center warmly houses two yoga studios, eight healing rooms for massage and energy healing, acupuncture, infrared saunas, nutritional counseling, as well as a classroom for workshops, events, and specialty classes. Located on the second level, (accessible by both stairs and elevator), the Center provides a calm, inviting environment for yoga and healing. 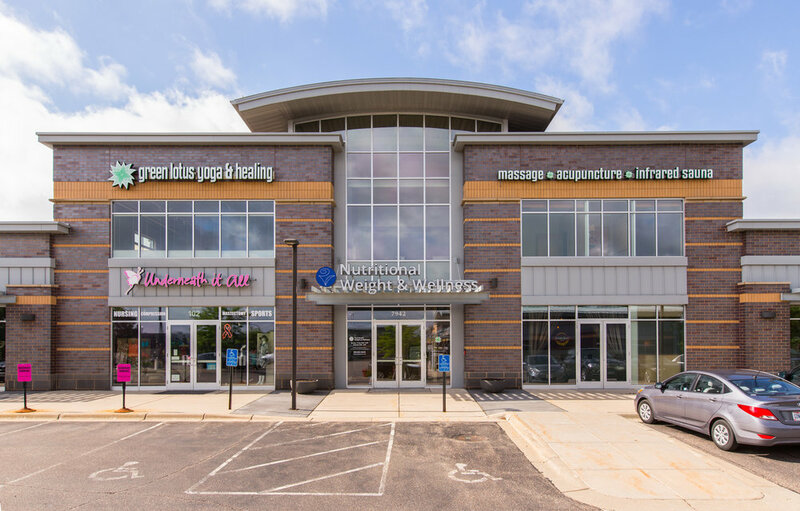 Our Eden Prairie Center, which opened in 2015 at 7942 Mitchell Road, warmly houses two yoga studios, eight healing rooms for many types of massage and energy healing, acupuncture, infrared saunas, nutritional counseling, as well as a classroom for workshops, events, and specialty classes. Located on the second level, (accessible by both stairs and elevator), the Center provides a calm, inviting environment for yoga and healing. Become a yoga teacher! It will change your life. Explore our 6-month program. Take advantage or our early bird special - sign up now and save $200! At Green Lotus, we pride ourselves on offering personal attention, compassionate assists and meaningful adjustments. We provide an environment where you can create a practice that strengthens and sustains you - all because our teachers and you will work closely together. Our yoga team cares about you and your health-journey. Looking forward to seeing you on your mat!